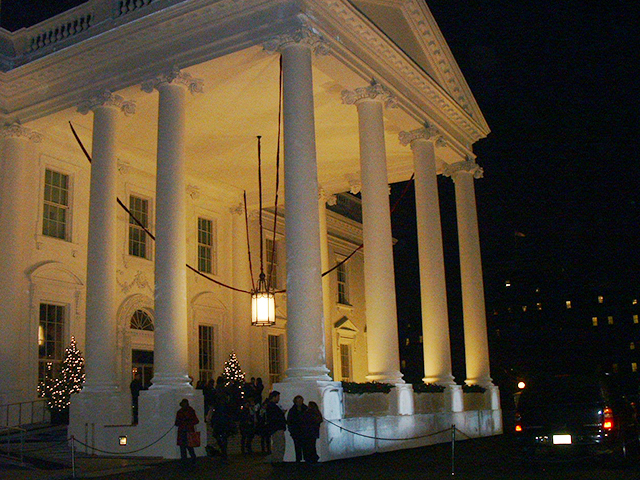 Eye on Washington principals were again invited to attend the White House holiday event. Please enjoy our slide show. 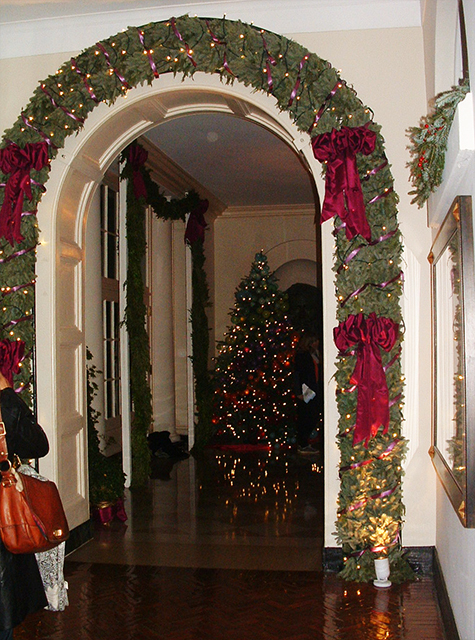 Upon entering the White House in the East Wing Landing, we were greeted with wreaths with festive snowflakes and old-fashioned lanterns and flickering candles to the threshold (pictured here). 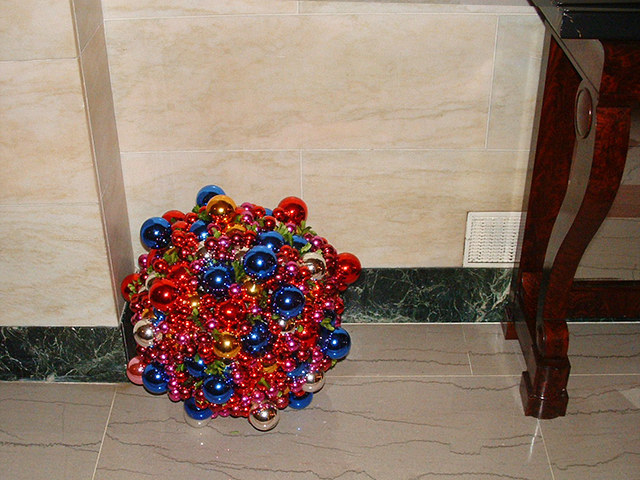 Several festive floor ornaments adorn the corridor leading to the East Wing. 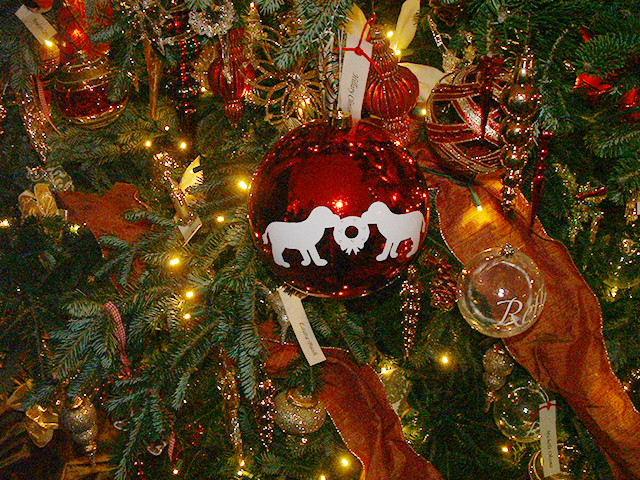 In the Green Room, decorations focus on the winter garden. 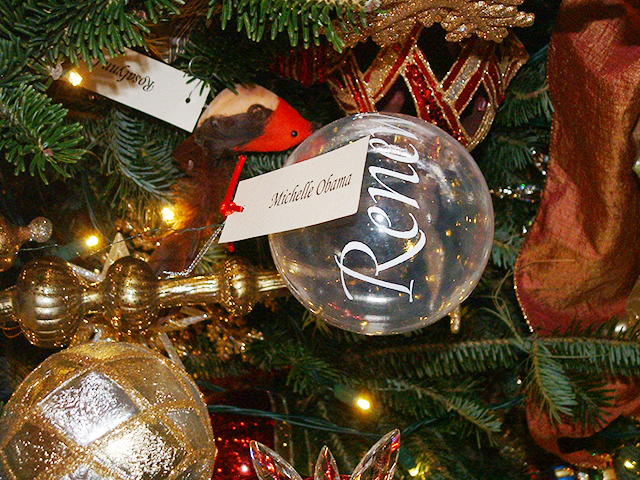 Miniature terrariums dangle from the trees and mantelpiece. 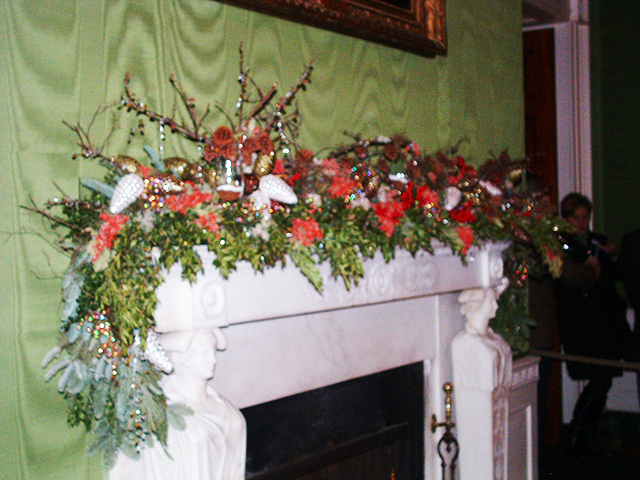 On the way to the upstairs rooms, the lobby area is well decorated as well. 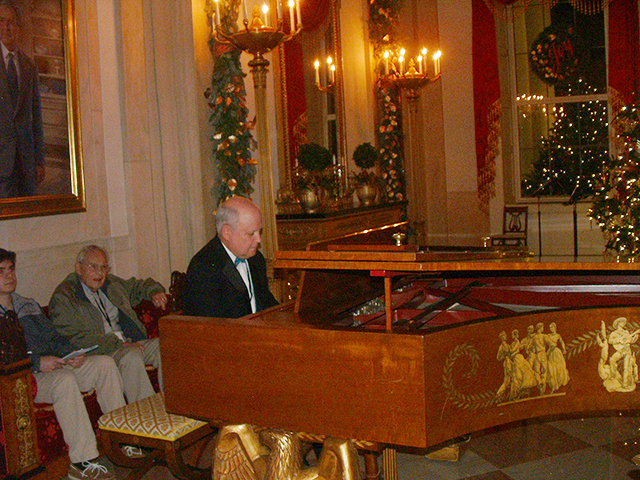 Guests were entertained by the piano player in the main Lobby outside the residence stairway. 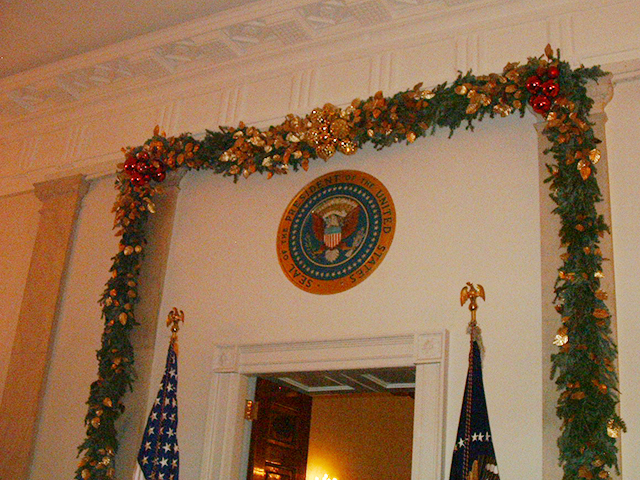 The presidential seal outside the Entrance Hall is wrapped in greenery and columns. 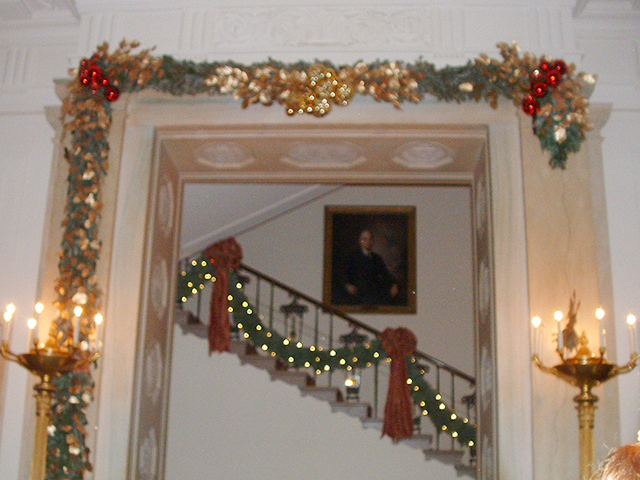 The stairway to the First Family residence is festively decorated. 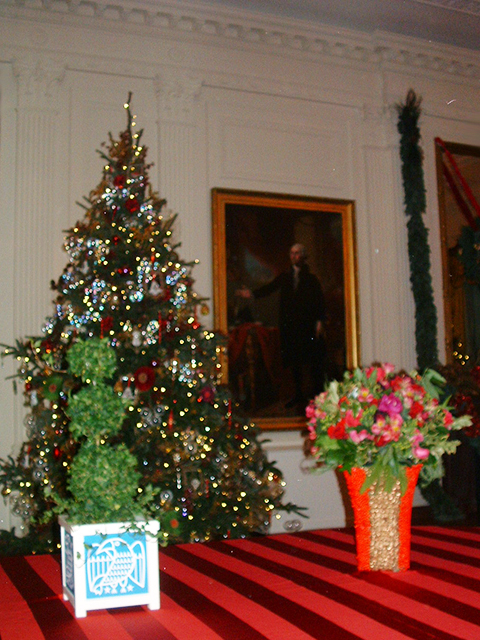 Upon leaving the White House, the last tree hosts several unique ornaments including this "double Bo" paper ornament. 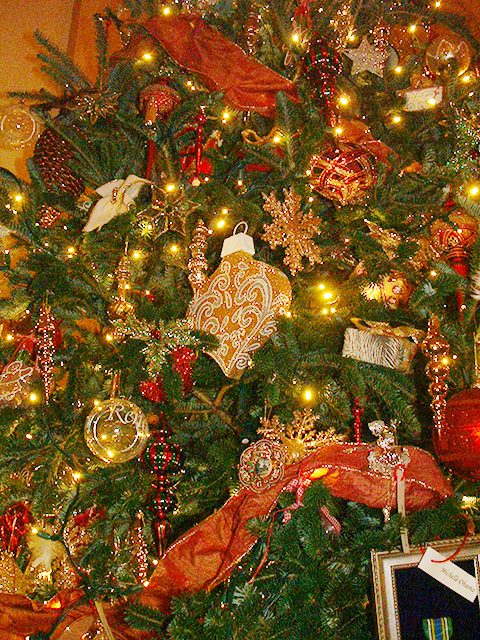 Another view of the spectacularly decorated tree right inside the East Wing from the portico driveway. 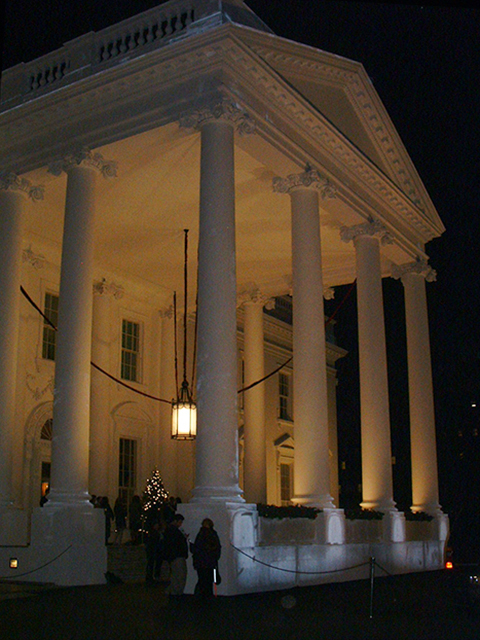 Walking down the portico driveway, last views of the White House front exterior. 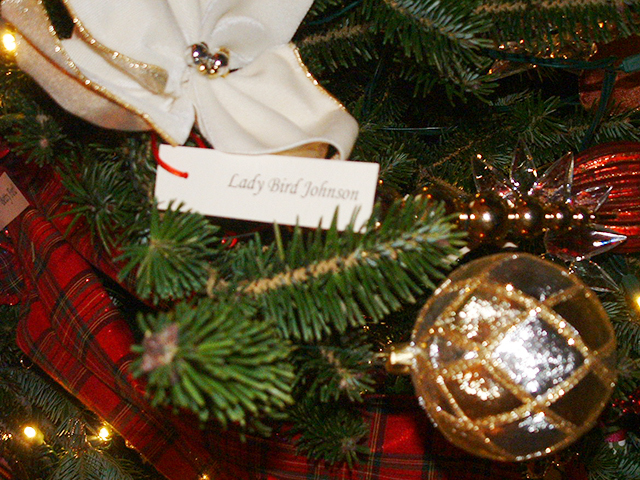 This year's decorations also honored our nation's first ladies. 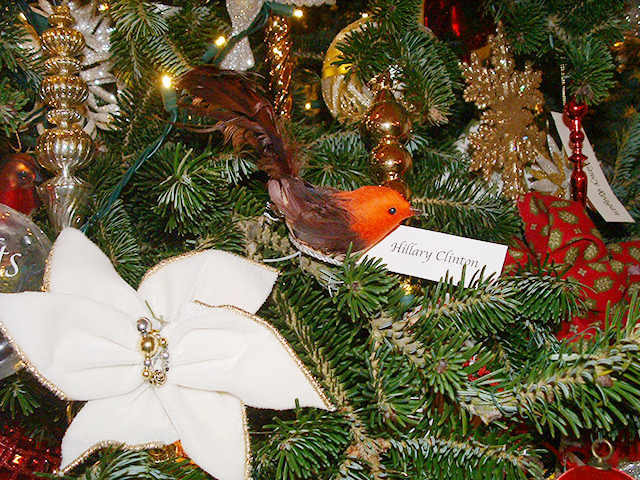 Ornaments from each of their periods of residence in the White House were highlighted. 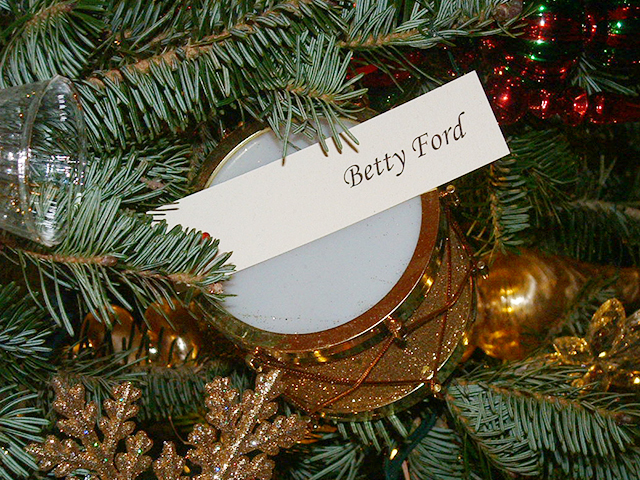 We tried to find all of them, but some were hard to capture on film. 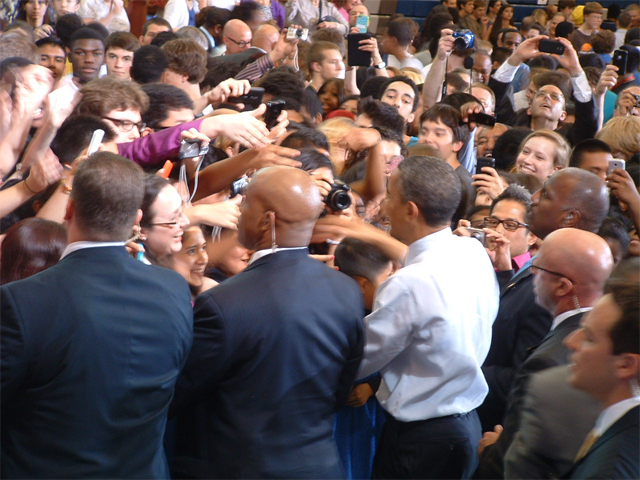 Eye on Washington's President attends an Obama speech on education and gets a prime seat on stage, behind the President. 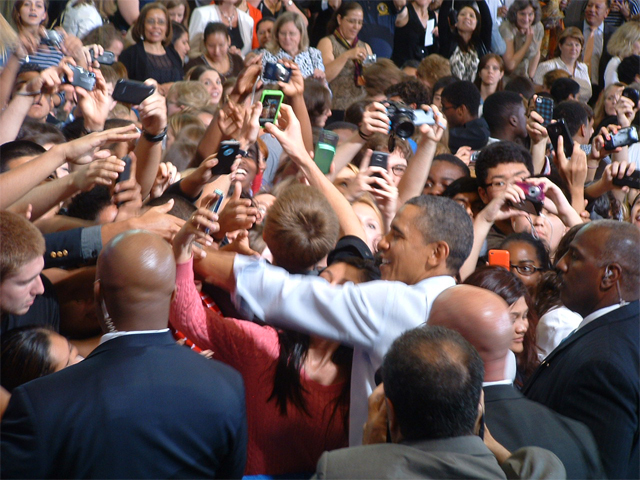 President Obama continues to greet the crowd. 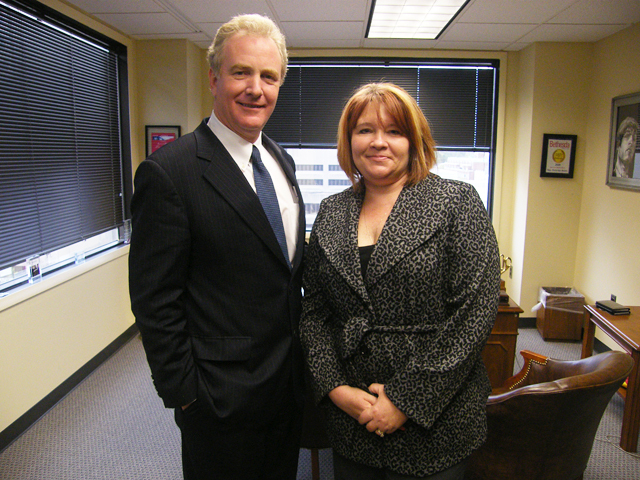 Eye on Washington's President Janet Kopenhaver organized a critical meeting between her clients and Democratic Leader Rep. Chris Van Hollen (D-MD) to discuss federal worker issues. 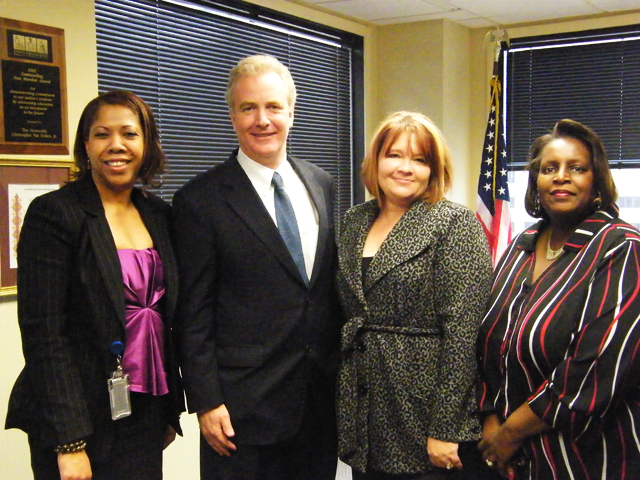 The three constituents meet with Rep. Van Hollen to discuss congressional initiatives to cut federal worker pay and benefits. 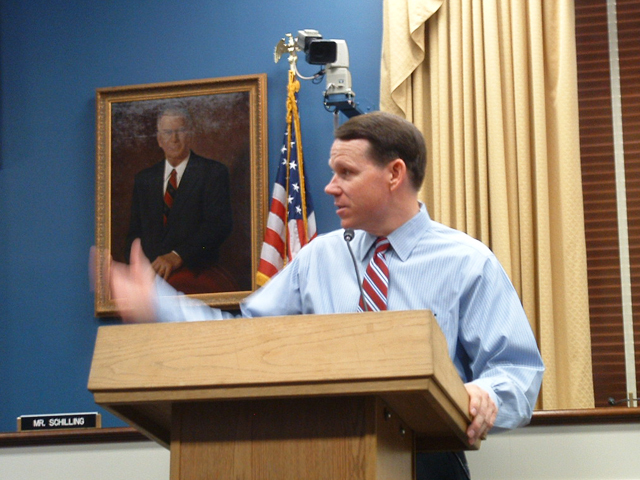 Kim Kirkpatrick, a client DC District Representative talks one-on-one with the Congressman. 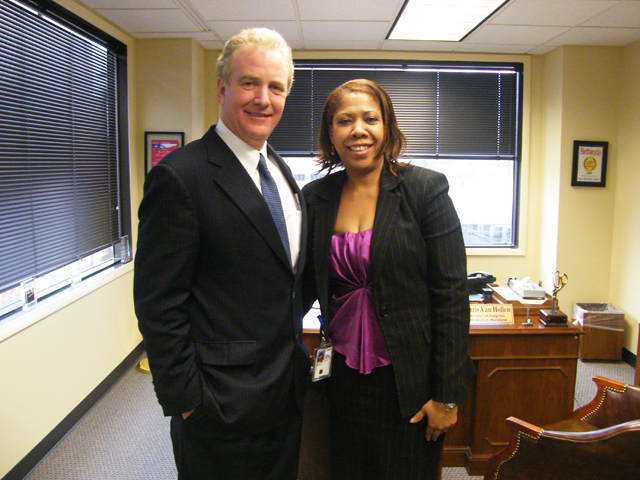 Christine Sloley, representing the a client Women on a Mission chapter, poses with Rep. Van Hollen. 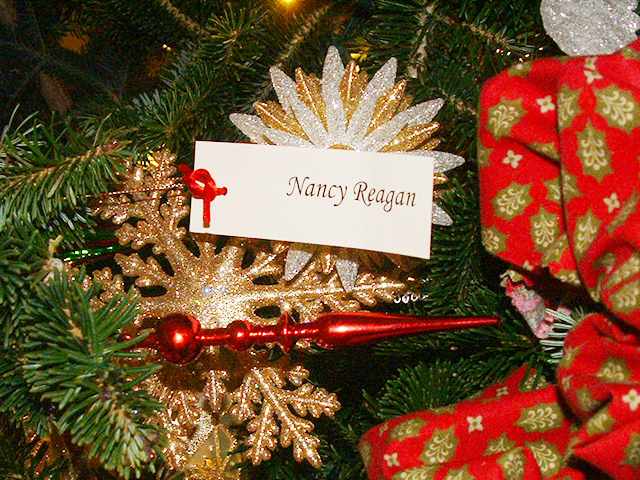 Janet Kopenhaver organized a second successful event for the Congressional Wire and Wire Products Caucus � an organization that she started from scratch. 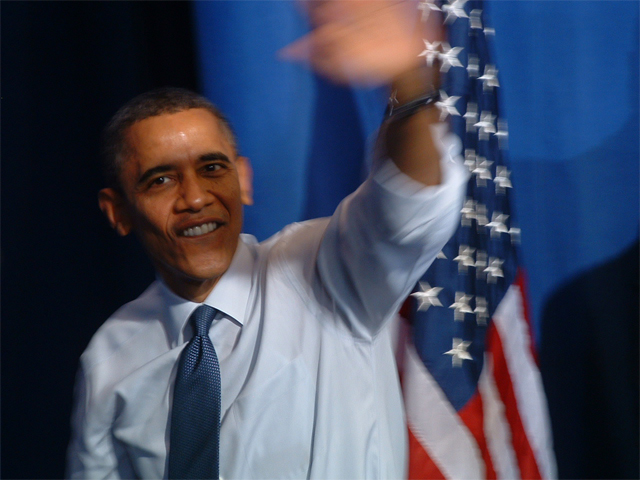 Several Members of Congress came to make remarks about trade with China. 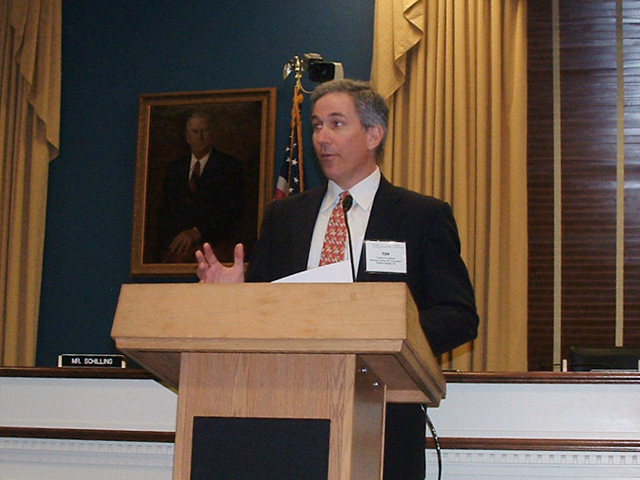 Tim Selhorst, the AWPA Chairman of the Government Relations Advisory Council, introduces the two Co-Chairs of the Caucus. 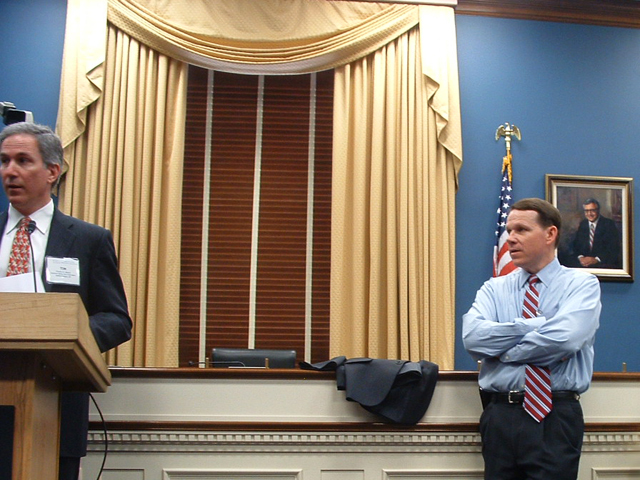 Rep. Sam Graves (R-MO), Co-Chair of the Caucus, awaits his turn at the mike. 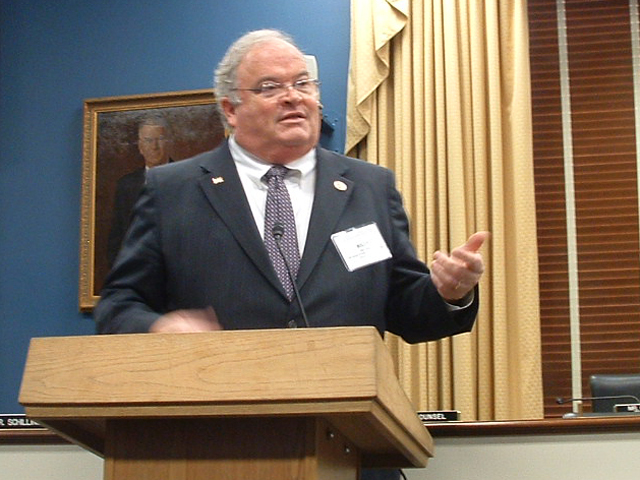 Rep. Sam Graves welcomes the standing room only crowd to the China Trade briefing. 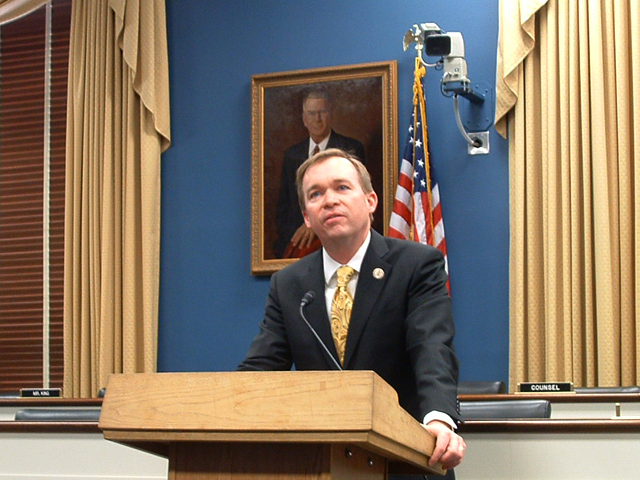 Rep. Mick Mulvaney (R-SC) discusses his ideas about China trade. 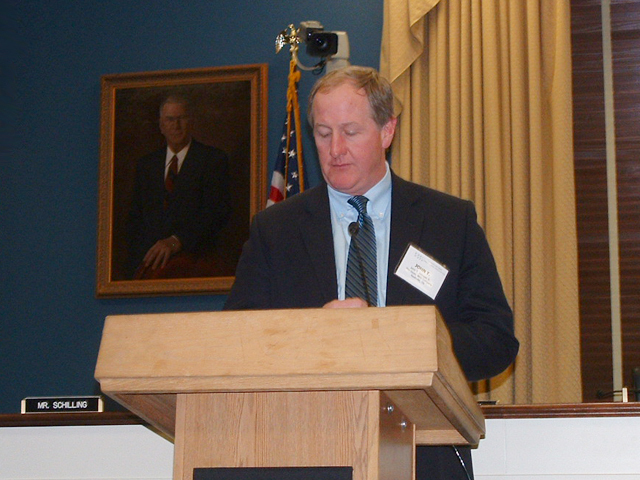 John T Johnson, President of Mid-South Wire, introduces his Congressman and Caucus Co-Chair Rep. Jim Cooper (D-TN). 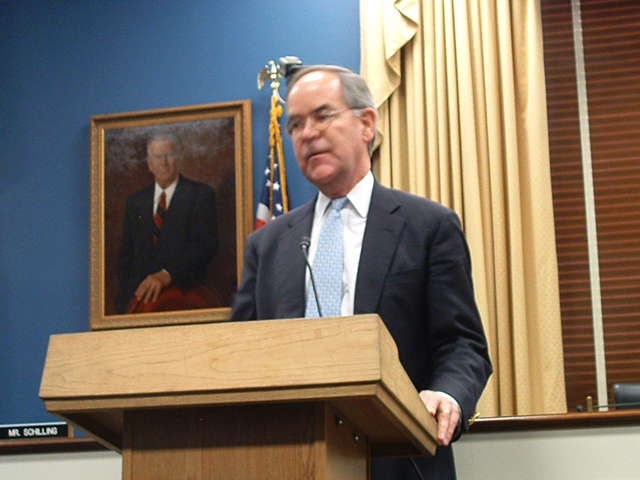 Rep. Jim Cooper (D-TN) welcomes the attendees and looks forward to all the discussion on China trade. 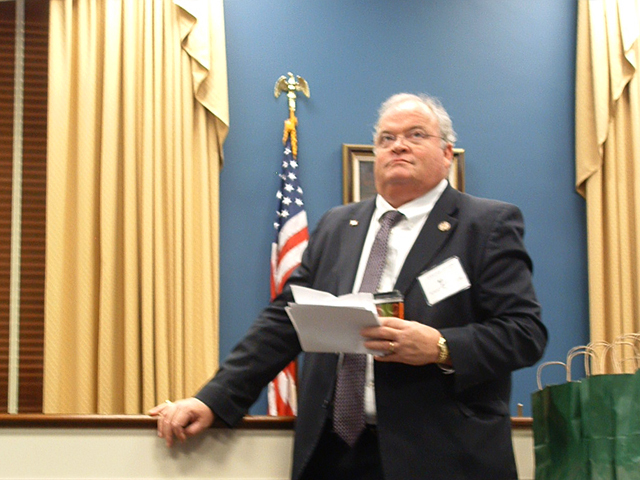 Rep. Billy Long (R-MO) reviews his notes before making remarks at the Caucus briefing. Rep. Billy Long takes the mike to discuss his ENFORCE bill that would curtail the illegal transshipment of goods through third countries. 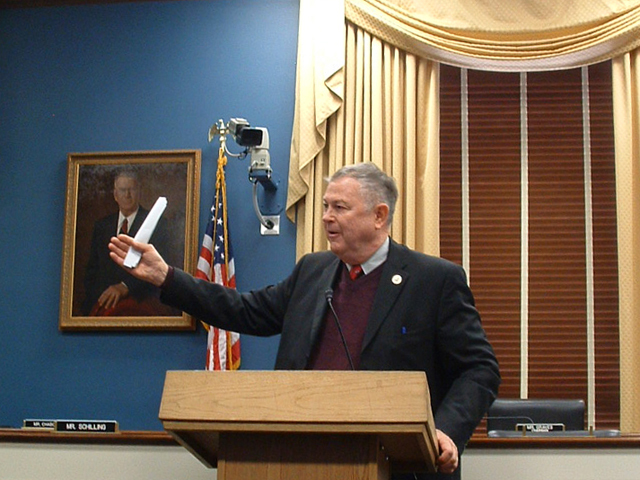 Rep. Dana Rohrabacher (R-CA) delivers energized remarks against the illegal trade practices of China. Following the Caucus briefing, Janet Kopenhaver arranged Hill visits for her clients to further discuss trade issues. 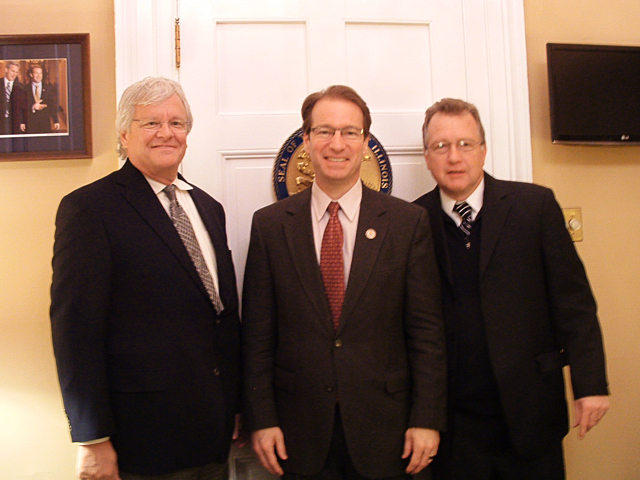 A group met with Rep. Peter Roskam (R-IL), Deputy Majority Whip in his office in the Capitol. 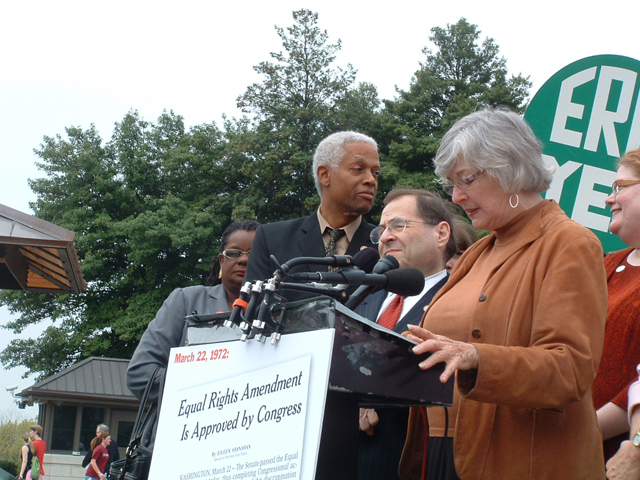 Eye on Washington's President, Janet Kopenhaver, in her capacity as the Washington Representative for a client participated in several events and press conferences marking the 40th anniversary on March 22, 2012 of the Equal Rights Amendment (ERA) passing Congress. 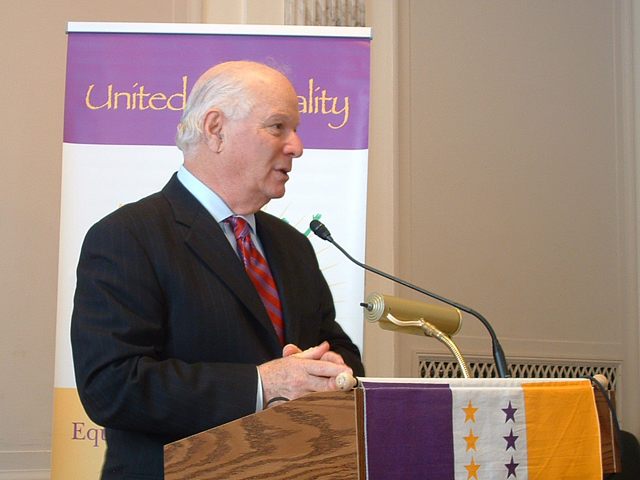 Sen. Ben Cardin (D-MD) opened the press conference sponsored by United 4 Equality to announce his introduction of an ERA resolution. Janet's remarks followed the senator's. 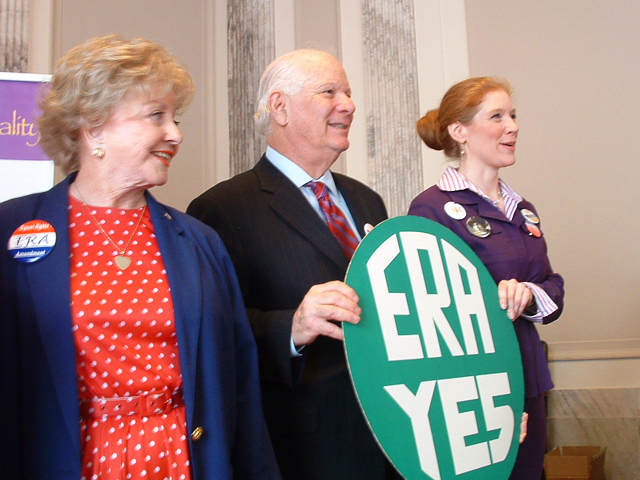 The organizers of the press conference presented Sen. Cardin with an ERA sign provided by Janet as a token of a client appreciation of his efforts. Janet Kopenhaver moved from the Senate press conference to the Capitol Triangle to appear in another Press Conference on the ERA anniversary sponsored by Rep. Carolyn Maloney (D-NY). Several legislators made remarks at the event including (from left to right) Gwen Moore (D-WI), Hank Johnson (D-GA), Jerrold Nadler (D-NY) and Lynn Woolsey (D-CA). Following the press conferences, Janet Kopenhaver traveled next to the Sewall Belmont House, home of the Suffragists, to celebrate the anniversary with legislators and other women's groups. 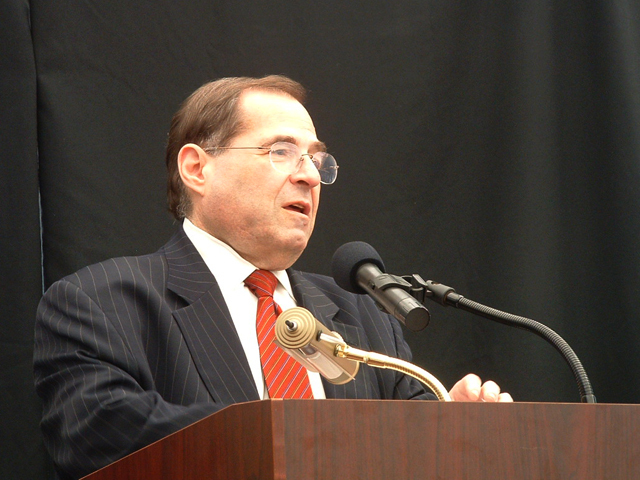 Rep. Jerrold Nadler (D-NY) welcomes the crowd and pledges his continued support for passing the ERA. 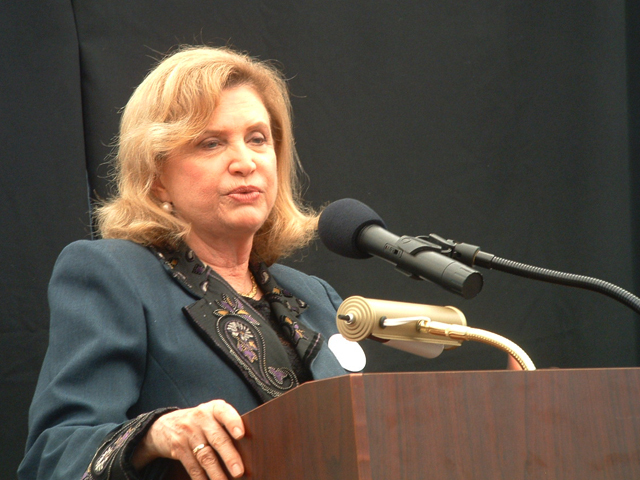 Rep. Carolyn Maloney (D-NY), one of the champion legislators leading the ERA fight, gets the crowd fired up. 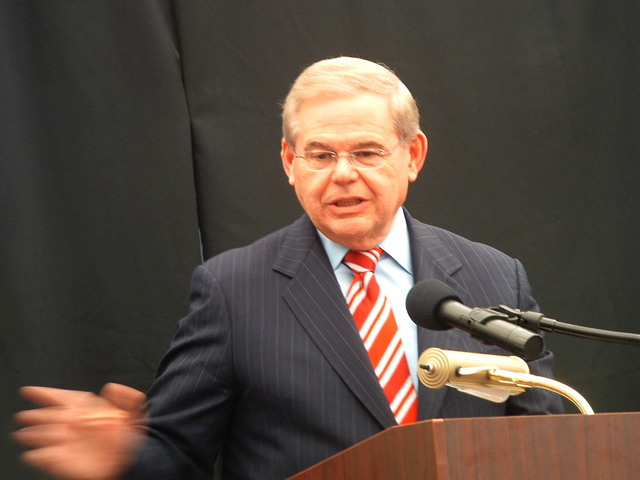 Sen. Robert Mendendez, one of the champion Senators in the ERA fight, discusses his resolution in the Senate.